Purim is a holiday based on a tale of court intrigue and drama, cruelty and compassion. 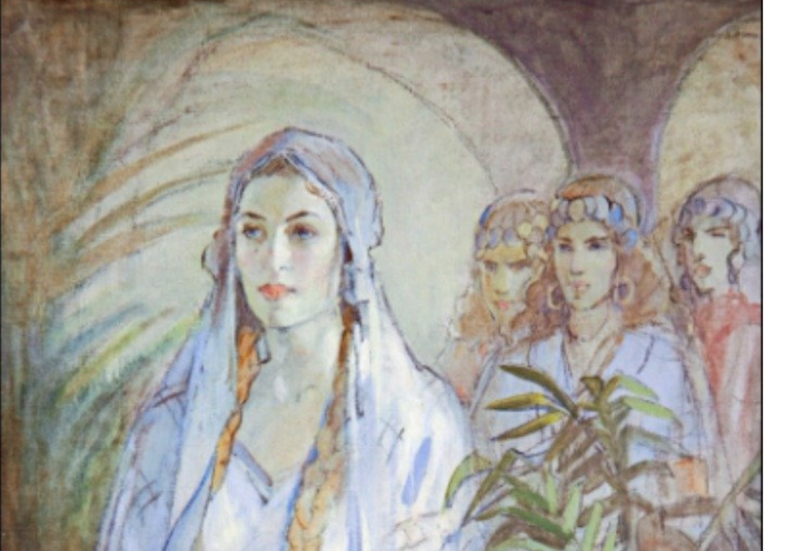 Esther was a Jewish girl, slated for the Persian king’s Harem, who ended up becoming his queen. In her royal role, assisted by her uncle, she foiled the plans of Haman, the king’s advisor, to humiliate the Jews and to commit genocide. In a time when women held almost no power, she found a way to to make a difference and save human lives. Dramatic story in a lavish, ancient royal setting. It has been said that that most Jewish holidays can be summed up in one sentence: “ They tried to kill us, they failed, let’s eat!” How can this dramatic story be boiled down to a dish, you might ask... Well, there's no easy answer to that one - we kind of eat Haman's hat! Yup, that's right - his hat! The most well known treat associated with this holiday are Hamantaschens (in Yiddish), also called Ozney Haman (in Hebrew). These are triangle shaped cookies, filled with an assortment of fillings, such as poppy seed, apricot and my two personal favorites: date and chocolate. The shape of the cookies is said to resemble Haman’s hat in an act of defiance, after all we are EATING his hat… These cookies end up in an exchange of goodies referred to as Mishloah Manot – the gifting of meals: a Purim tradition of sending goodies to loved ones and neighbors. After a full Sunday of baking, my counter is littered with crinkled parchment paper, sticky fillings and some crumbs. BUT... the Hamantaschens are baked, cooled and packed to be shipped away tomorrow to my kids. I no longer share with them all the traditions of this holiday, such as dressing them in costumes and going to hear the Megilah read (yes, that's the origin of the expression "the whole Megilah" - the whole story...) Hopefully, sweet memories of their childhood Purim celebrations will come to mind when they bite into these. 1. The dough combines butter and shortening to make a soft and flavorful cookie. Make sure they are both at room temperature and creamed together well before adding the rest of the ingredients. 2. Make sure the fillings are completely cooled before placing them on the dough! You don't want to melt the butter in the dough even before baking it! 3. To prevent the dough from sticking use plastic wrap on your counters and on top of the dough as you roll it out. This way, no flour is needed, the dough does not dry out and clean-up is a snap!